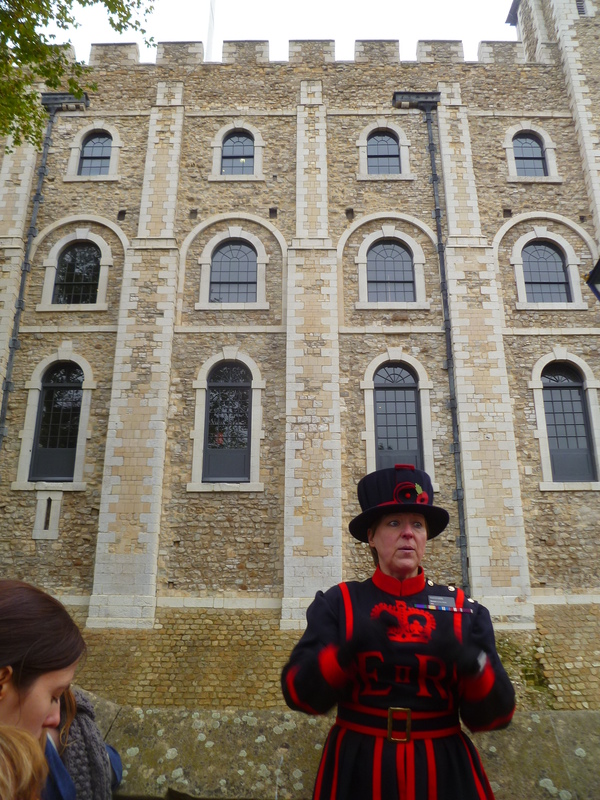 Moira, our Beefeater tour guide, explaining the history of the White Keep. The tour lasted about an hour and was fairly informative. I like to think I’m a little more informed about British history than French, so most of the names and characters were relatively familiar. There was still a lot I just had never learned, so it was pretty fun. 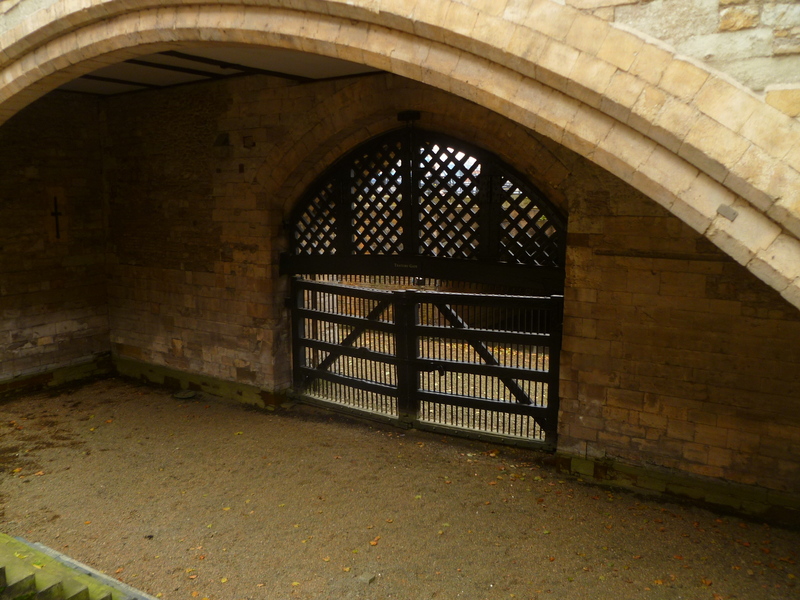 Back in the day, they used to boat prisoners in from the Thames through the Traitor’s Gate. Such notables as Sir Thomas More, Queen Anne Boleyn, and Sir Walter Raleigh were escorted in this way, often to an unfortunate end. There’s a reason the Tower of London has a bloody reputation. A memorial for those executed. Royal prisoners and other worthies were not led outside to hang like the common traitors. Instead, special scaffolding was built and they were beheaded in the courtyard. King Henry VIII (of the many wives) allowed his second wife, Anne Boleyn, the privilege and expense of a French swordsman because they were thought to be faster and more thorough than the axeman, who needed a couple swings. What a stand-up guy. I mentioned the Princes in the Tower earlier and I figure I ought to explain. 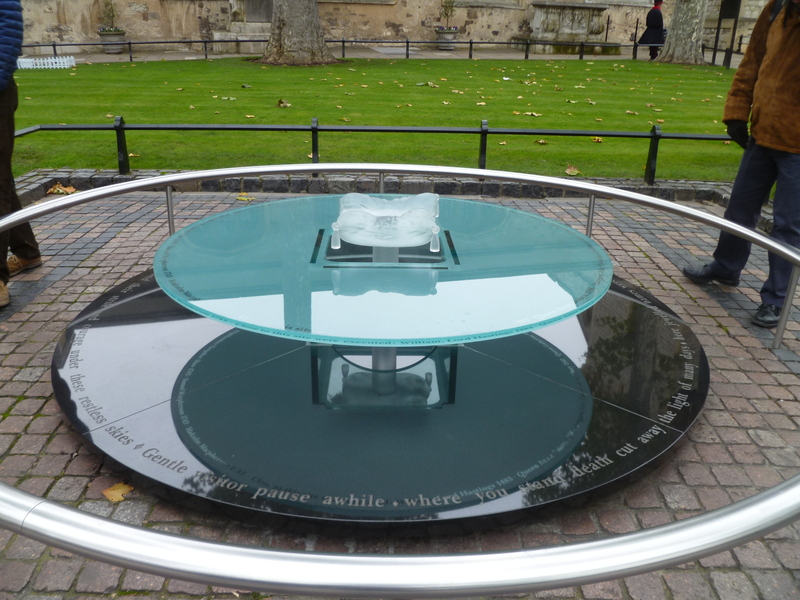 One of the mysteries of the Tower is the Lost Princes, the two sons of King Edward IV. When Edward died, he left the realm to his son Edward V and named his brother Richard as regent. Now, Richard was an ambitious man, and the only thing standing in between him and the throne were two boys. Richard and his brothers had already killed one king (the three brothers supposedly smothered Henry VI), and George himself had been drowned in a barrel of wine for fomenting rebellion against his eldest brother. Richard had the support of the north through his wife Anne Neville, the only daughter of the Kingmaker Richard Neville. It’s not hard to guess why, other than “why the hell not?”. 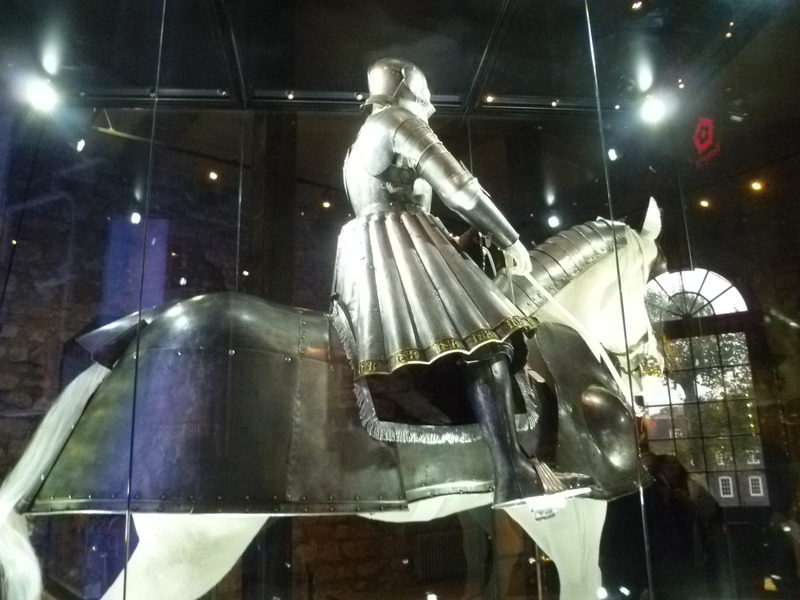 So he took the uncrowned Edward and his brother under his protection and installed them in the Tower in April of 1483. The Queen Consort, Elizabeth Woodville, and her family tried in vain to free them, but just ended up with a few relatives dead and her own marriage declared illegitimate. Richard was crowned as King in June, two months after his brother had died. The boys were never seen again. Of course, Richard himself comes to a sticky end. See, not everyone was happy about how this had turned out, including a young man called Henry Tudor. (This is all during the War of the Roses, mind you, and he was distantly related to the ousted Henry VI, giving him a distant claim on the throne.) He fought and killed Richard, married the eldest sister of the lost princes, Elizabeth of York, and founded the Tudor dynasty. Richard was further immortalized by Shakespeare in the eponymous Richard III, where he’s shown to be a grotesque hunchback, cheerfully murdering anyone in his way to gain power. The skeletons of two young boys were found at the bottom of the stairs in the White Keep in 1674. Believed to be the Lost Princes, they were reburied with full honors at Westminster Abbey. The princes are far from the only royals to have been kept and killed in the Tower. Another famed prisoner was the Lady Jane Grey, the Nine Days Queen. With a title like that, you know it’s going to end badly. Poor Lady Jane had the misfortune to be married to a very ambitious man with a very ambitious family. King Henry VIII had decreed that the order of succession would be his son Edward, then his eldest Mary, followed by Elizabeth. When Edward died after only five years as king, he had named Lady Jane as his heir (disinheriting his half-sisters), probably at the behest of her powerful father-in-law, who just so happened to be Edward’s regent. 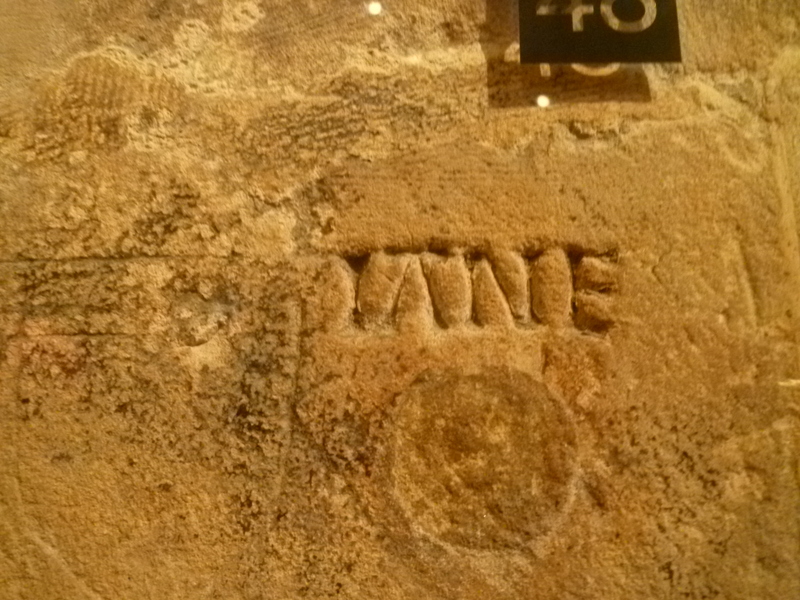 IANE, or Jane. Apparently, they hadn’t quite worked out how to write “j” back then. You can probably guess how the story ends. The bid for the throne fails and poor Jane had nine whole days as Queen, before she was imprisoned in the Tower with her husband. She had the delightful pleasure of a room overlooking the square where they built the scaffolding and watched as they beheaded her husband a few hours before her own execution. Sure makes you glad we decided on a peaceful transfer of power like elected representative democracy, huh? I think this belong to Henry VIII? I’m not sure. The White Keep serves as a repository for historical weapons and the like. 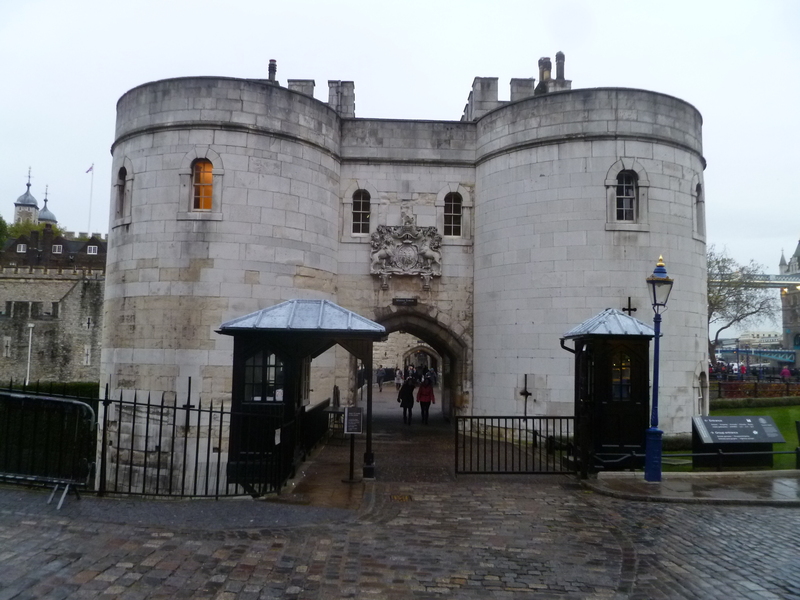 The Tower compound is also home to the Crown Jewels, which have some fairly impressive hunks of shiny rocks. Unfortunately, photography is not allowed inside the building with the jewels so I don’t have anything to show you all. Apparently, images of the jewels are copyrighted by the Queen, and, as Moira put it with grim humor, “we still have all the equipment”. 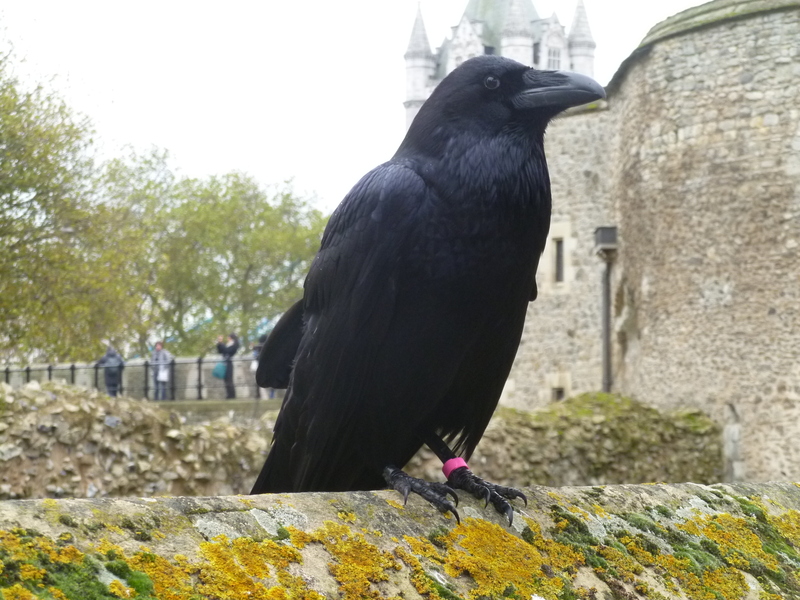 Last, but not least, I present to you all one of the famed Ravens of the Tower. Merlin, one of the Tower’s ravens. Legend has it that the ravens must remain in the Tower, or England will fall. Needless to say, no one wants to test it and their wings are clipped. (One made a spectacular bid for freedom last year, but was spotted by a discerning member of the public after a few days and promptly returned. I guess one jail breaker doesn’t void the prophecy?) They’re pretty acclimatised to humans though, and Merlin here let me wander right up next to him. Ravens are freaking HUGE, by the by. Like, seriously large birds. If you’re ever in London, I really do recommend spending a few hours in the Tower at the minimum. For one thing, you can come and go as you please, which is a sight better than how it used to be. Also, I had the most divine Cornish pasty at a stand next to the White Keep, oh my god where have they been all my life? And anyways, it’s always fun wandering around a castle keep! If you or I ever become rich enough, I would like a small castle please, 3 bedroom 3 bathroom, dining hall a must, and a small attached dungeon, ghosts are preferred, but not a deal breaker.